Agosín is an acclaimed poet and essayist whose dozens of published works explore the lives of women and Jewish people in her native Chile and the struggle for human rights around the world. I Lived on Butterfly Hill, her first novel for young readers, is the story of 11-year-old Celeste Marconi, who lives with her parents, grandmother, and Nana (nanny who is considered part of the family) in the port city of Valparaíso, Chile. When she sees the harbor full of large ships, Celeste knows something is wrong. Her friends don’t notice, except for Cristóbal Williams, whose magic pendulum also shows trouble. Celeste’s parents, both doctors, are busy helping the survivors of a landslide in a poor neighborhood of her city, which is built on 42 steep hills. Shortly afterward, when a military coup topples the elected democratic government, Celeste’s parents are forced into hiding. They leave the youngster in the care of her grandmother, who had escaped the Nazi Holocaust, and Nana Delfina. At school, things change as well. Her beloved principal flees and is replaced by a military officer. One of her best friends, along with her parents, disappears. Girls are forced to wear skirts, and boys must cut their hair short. Children who fall asleep in class, give the wrong answers, or misbehave in any way, are beaten, among them her friend, Cristóbal. Eventually, Celeste’s parents send word that it’s time for her to leave the country. Now 12 years old, Celeste travels alone to Maine to live with her Tía Graciela, her mother’s flighty sister. Here, she adjusts to a new language and culture, but two years later, just when she begins to feel comfortable in her new home, the dictatorship falls, and she is sent back. But her parents are still missing, and with the help of old friend Cristóbal and his magic pendulum, she sets about trying to locate her parents and all the other disappeared. Everyone in Chile has an explanation for earthquakes. I say that the earth has the right to yawn and stretch just as I do in my bed when I don’t want to wake early for school, and also has the right to sneeze as we all do when covered in dust. Magic and mysticism are important elements, and Agosín adds dimension and depth by showing how children and adults from the different cultures within Chile—including Nana Delfina, a Mapuche woman from the south of Chile, and Grandmother Frida, a Jewish refugee from Central Europe—incorporate the supernatural into their lives. Celeste emerges as a strong character, one who will engage and inspire middle grade readers, as she allays the suspicions of her Maine classmates to become a good friend to them and later on, as she leads a harrowing search to find her missing father. In a market filled with narrow, formulaic, cookie-cutter books, I Lived on Butterfly Hill is a standout, a novel that will challenge middle grade readers and show them that there is a fascinating and beautiful world beyond their horizons. Highly recommended. Parts of this review appeared in The Pirate Tree (www.thepiratetree.com) and the “Waging Peace” blog of the Albany Times-Union (blog.timesunion.com/wagingpeace). 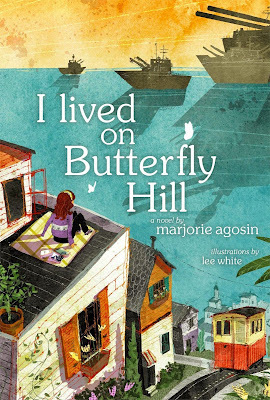 While the book is beautifully written and exposes the horrors of the overthrow of Salvador Allende in Chile through the eyes of a young girl, I was shocked when I read the book to find a casual, uncritical inclusion of Gone with the Wind in "I Lived on Butterfly Hill" by Marjorie Agosín. For her own safety, the young protagonist comes to the U.S. after her parents go into hiding in Chile. She stays with her aunt in New England. For comfort, they watch a film together. Of all the films the author could have selected – it is Gone with the Wind. It is introduced with NO critique. The protagonist identifies with Scarlet O’Hara. Why did this film selection make it past the editors and the award committees? Another concern is that I do not think it said anything about the U.S. role in the coup and decades of U.S. backing of the brutal dictator, Augusto Pinochet. (I did not reread the book to verify this point, so I hope someone else adds a comment if I missed a reference to the U.S. role. However, there is no doubt about Gone with the Wind.) If I am correct that the U.S. role is missing, that is no small concern given the fact that this book is written largely for U.S. readers. It can reinforce the stereotype that Latin American countries are unstable, counter-posed with the “good North” that provides refuge for the protagonist. I wish an editor would have addressed both of these concerns pre-publication – or that they are both addressed for a future edition – since young people should learn about Chile. The author is very much aware of the U.S. role in the coup that brought the military dictatorship to power and referred to it in her speech for the Pura Belpré Award. There are also several subtle references to it in the first part of the novel. One is Celeste's mother observing the ships in Valparaíso harbor and saying "And some even say that the military would try to take over Alarcón's government if it were ever strong enough...perhaps if it had aid from afar..." Later, when the takeover does happen, the only songs on the radio are military marches and popular songs in English from the United States. The U.S. support for the Pinochet dictatorship over 17 years is somewhat moot in this book, since it is an alternative history where the dictatorship ends after the despot's sudden death (in a nod to Gabriel Garcia Marquez's Autumn of the Patriarch, I suspect) after only two years. Along with Westerns and their stereotyped portrayals of American Indians, Gone With the Wind is one of those unfortunate cultural artifacts from the United States that has made its way around the world. I interpreted Celeste and her aunt's watching the movie as evidence of their naivete about the United States, as she identifies with Scarlett's travails on one hand and experiences racism and anti-immigrant sentiment in her school and the community on the other. In a lot of subtle ways, we see the cultural imperialism of the United States and its effect on Celeste, her family and her friends in Chile in their idealization of these sanitized images that deny the true history of racism and genocide. But it's subtle, and I'm not sure middle grade readers will pick it up without a broader discussion of how decades of media images have shaped perceptions of the United States in Latin America and elsewhere. Deb, you question how the uncritical reference to Gone With the Wind made it past an editor. I wonder if the impetus not to criticize came from the fact that this book is a middle grade title (and it is middle grade, not YA, much as some would want to call it YA because of the political content that remains in the book), and corporate-published middle grade (and much of YA too) is so politically sanitized. In Gringolandia, I made it perfectly clear that the U.S. sponsored the coup -- that's a major reason Daniel's father doesn't want to live in exile in "Gringolandia" -- but mine was proudly published by a small press and made zero concessions to what a corporate publisher would consider "appropriate." I made that point in a panel on diversity and intellectual freedom at the ALA conference this past weekend, arguing that librarians and reviewers need to recognize and support small presses to make sure critical viewpoints are represented.